To be honest, a lot of the reasoning behind this blog is stemmed from personal experiences. As a thinner girl, I have long dealt with skinny shamming, but it is my own personal admittance of body shaming against others that I believe makes this blog truly worthwhile. A lot of people don’t realise they’re guilty of body shaming others. They don’t understand that thoughts about others which are vocalised, and may seem harmful, are fund insulting by the subject. What makes this very weird, is that I don’t judge those I know, and know well. I never think twice of someone I love, yet a complete stranger can walk pass me and I can jump straight to a conclusion regarding who they are based on their appearance. I understand this is completely pathetic, and I’m often disgusted when I catch myself in the act. When I do, I immediately stop, and push my thoughts to other things. To be honest, I’m not sure why I do it. I guess I often forget that while my passions lie in fashion, others have different priorities. And that’s not a bad thing. My conflict here however, is that I believe that style and what we wear is an externalisation of our personality, and while it may not always suit current trends etc, presenting oneself well is important. I don’t mean that people need worry about the latest and greatest unreasonably priced item around, but that they’re comfortable and reasonably-dressed. Even if that’s a t-shirt and jeans, if it fits the situation, then go for your life. I know this is a grey area, people have such different beliefs regarding what one should wear, and I know it is of no one else’s business what others think of the clothing they chose, but I believe that taking care of yourself and being conscious about what you wear shows self-respect. 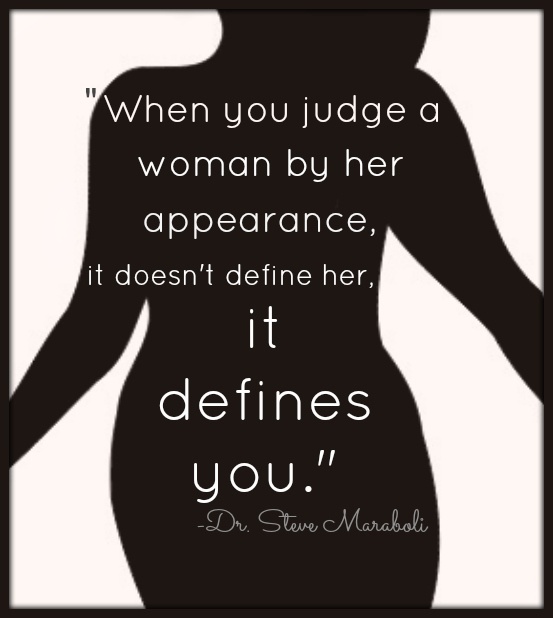 To end body shaming, the first step to to question whether or not you’re guilty of doing so. Whether you judge what others wear, make back-handed compliments regarding their looks, find natural flaws in another’s appearance when intimidated to make yourself feel better or make someone feel bad for being thin or overweight, you need to stop and be honest with yourself about the reasons you do it. Think about when you do it most, is it at a party when you’re feeling inadequate, in the office, amongst friends? Once you identify the situations, its time to start working on yourself, work out why you feel the need to judge, and then start to push those thoughts out of your mind. A lot of people think that a solution to body shaming is to (in your head) find something you like about that person, but that’s just as bad. The concentration is still on judging another’s character and looks. It doesn’t matter if you’re finding flaws or perfections, it’s just as demeaning. How would you feel if someone felt compelled to force out bad thoughts regarding your looks by trying to find something positive. Compliments should come naturally, and you should only voice them if you believe that someone would be genuinely happy to hear them. Remember that body shaming is engrained in us by the media we consume, try swapping those trashy gossip mags for better reading material. I encourage your feedback and thoughts regarding this issue, all comments, unless deemed off topic or insensitive, will remain.